Don’t read on if, like me, you are going to be jealous of those who get to spend Aug. 23-26 at such an event. Two of my fellow Coexist Campaign champions are getting ready to head to Cheltenham, England for the four-day Greenbelt Festival. In addition to getting their fix of fish and chips (bonus points if they bring me back a couple of Bounty Bars), they’ll be enjoying music performances by artists like Amadou & Mariam, Lemar, and Thea Gilmore. Off the top of my head, I can’t think of another festival that combines so many different mediums and ideas, mixing arts, faith and justice together for a long weekend. It’s the perfect place to talk about and experience coexistence, which is why we’ll be there. We have some great new products we’ve developed that we’re excited to debut (you may have seen them on Twitter, Facebook or Instagram over the last week or so). Like with all the other Coexist Campaign clothing, every item you buy contributes to schools in India where students are learning side-by-side with friends from different backgrounds. Follow us on Facebook or Twitter and let us know what slogans or styles we should be working on next. If you can’t make it to Greenbelt, keep checking back with the Coexist Store. 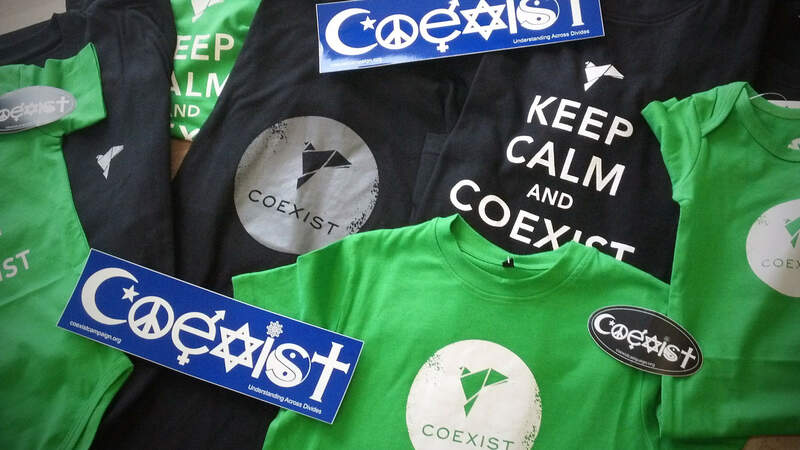 You might just be able to grab a “Keep Calm and Coexist” t-shirt of your very own.